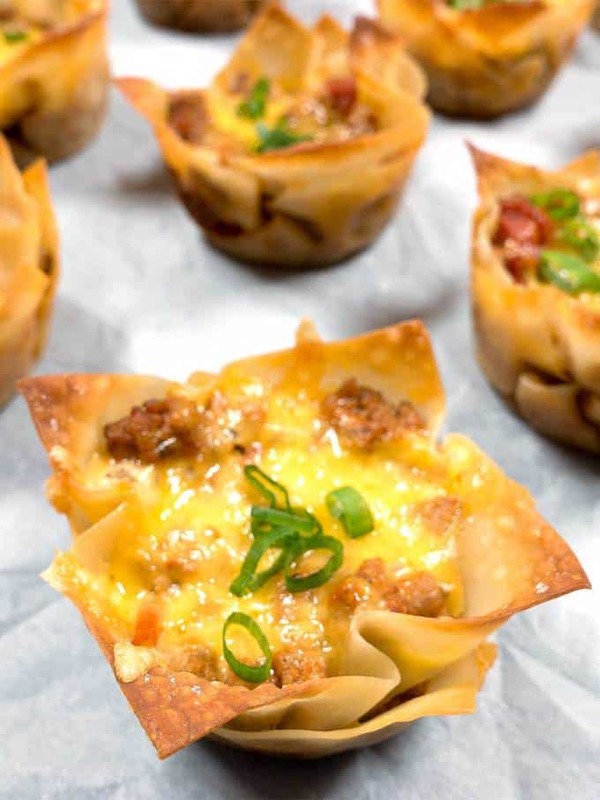 Tasty taco filling layered with melted cheese in crispy wonton wrappers makes the perfect appetizer. What’s even better is that they’re super easy to make and just as yummy made ahead of time and reheated! 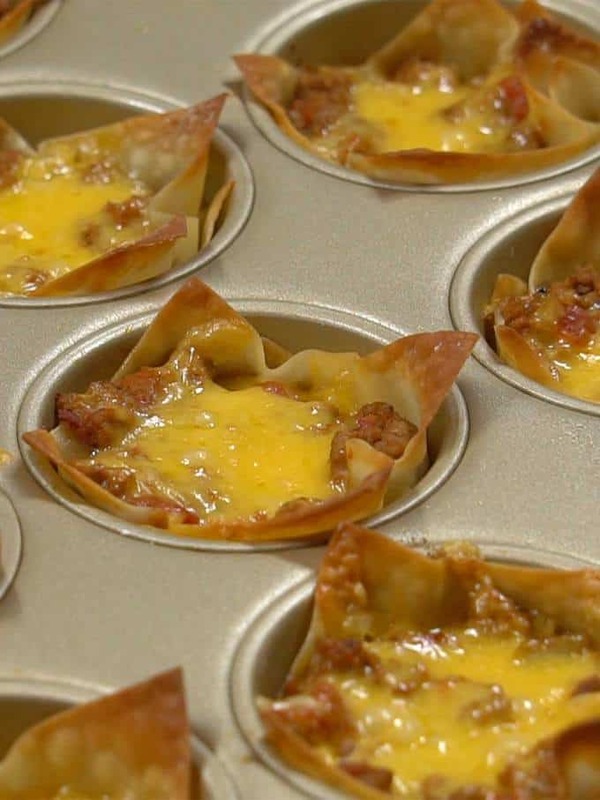 I used the following ingredients to make these Tasty Taco Cups: Ground turkey, my own DIY taco seasoning, Rotel Original Diced Tomatoes & Green Chilies, water, wonton wrappers, and shredded cheddar cheese. I always tend to use ground turkey instead of ground beef because it’s so much more tender. You could use store-bought taco seasoning, but homemade is so much better! As a first step, I made the taco filling. I browned and drained the ground turkey. 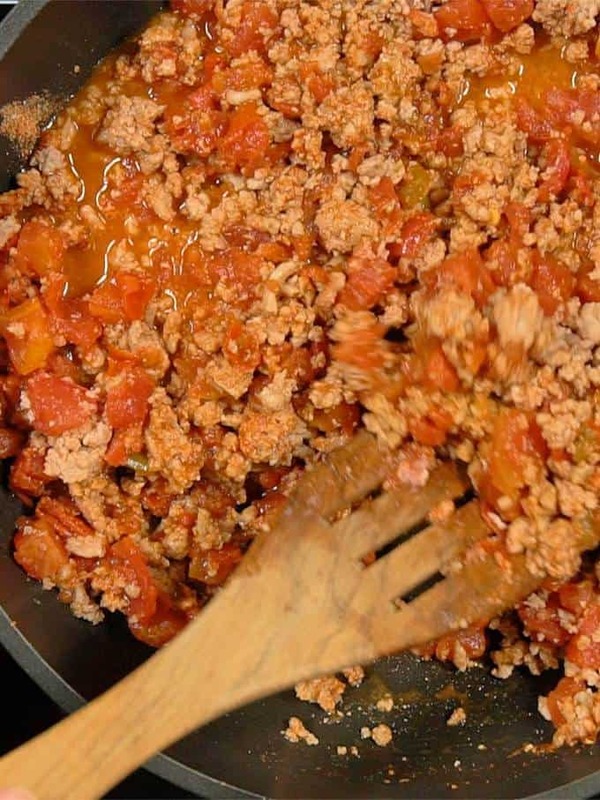 After returning the ground turkey to the skillet, I added the taco seasoning, Rotel tomatoes, and water. I cooked the mixture over medium heat for about ten minutes until most of the liquid had evaporated. 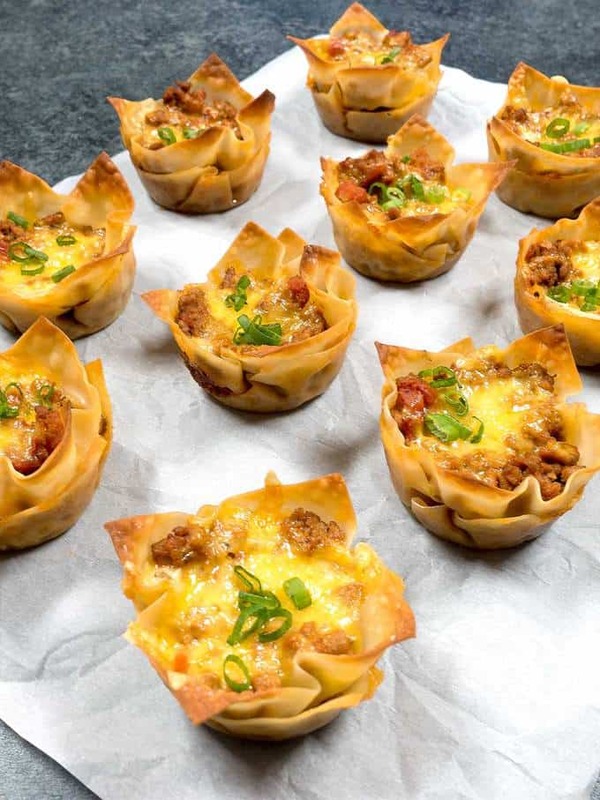 When the meat mixture was done, I layered the Tasty Taco Cups in a muffin pan that I had sprayed with non-stick spray as follows: (1) a wonton wrapper; (2) some taco filling; (3) shredded cheddar cheese; (4) another wonton wrapper; (5) more taco filling; and (6) more shredded cheddar cheese. I finished the taco cups by lightly brushing the tops with some vegetable oil. I popped the Tasty Taco Cups into a preheated 375° F oven for about 12 minutes until the wontons were a crispy golden brown. After allowing them to cool a bit, I removed the taco cups from the muffin pan. Now was the moment of truth – did they taste as good as they looked? The answer – a resounding yes! The Tasty Taco Cups were absolutely delicious either topped with sour cream and green onions, or plain. Yum! Here’s a short video showing how easy they are to make! Preheat oven to 375° F. Spray muffin pan with non-stick spray; set aside. Brown and crumble ground turkey in skillet over medium heat. Drain in colander; rinse well to remove as much grease as possible; drain well. Return to skillet. Over medium heat, add taco seasoning, Rotel tomatoes, and water. Stir to combine. Cook uncovered for 10 minutes or until most of liquid has evaporated. Cool 10 minutes. 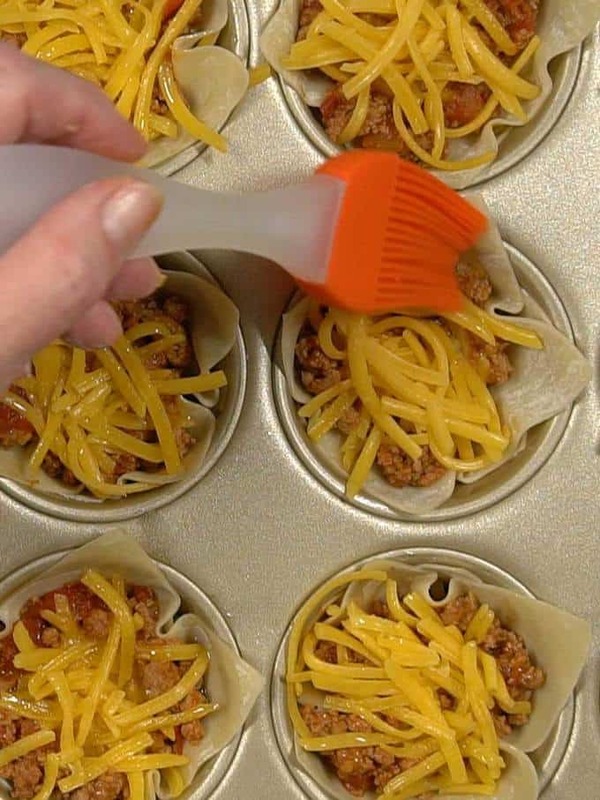 Layer taco cups in muffin cups as follows: (1) wonton wrapper; (2) 1 tablespoon meat mixture; (3) 1 tablespoon shredded cheese; (4) another wonton wrapper; (5) another tablespoon of meat mixture; (6) another tablespoon of shredded cheese. Brush top lightly with vegetable oil. Bake at 375° F for 12 to 15 minutes or until wonton wrappers are golden brown. Remove from oven; let cool 10 minutes. Remove from muffin pan. If desired, garnish with sour cream and/or sliced green onion tops. Yield: 12 Tasty Taco Cups. These look wonderful! I love the idea of making them ahead of time and reheating. Definitely having these at my Superbowl Party! I just had the last one for lunch - heated it in the oven at 375° F for about 10 minutes. They can also be reheated in the microwave, but lose their crispiness. It was absolutely delicious! This looks really good. I can't eat dairy, but I can totally see this working with an alternative for the cheese. I think that it would work fine with a cheese alternative! These Taco Cups look delicious and I love your video! These look delicious! I love single bite appetizers!